Upon entering the Hope Mill Theatre, I was plunged into the position of a refugee by being asked to fill out papers to pass border control, which granted me access into the production. However, this formality seemed slightly futile. Although I had been told to keep these documents at all times, they were not once checked again. Rather, I was then given the freedom to explore (at my own leisure) the installations set up in the foyer, as an outsider. Walking around the room, I sighted boxes of clothes, photographs, dirty washing lines, and listened on telephones to snippets of stories that explored the theme of immigration. Most affecting of all, was a chalkboard that posed the question “what is a border?”, allowing the audience to write answers beneath in chalk. This was successful at stimulating participators to consider the “imaginary control” that is enforced by borders, before entering the main performance. After being seated, a silent video was projected onto a screen, while two performers told stories that explored the lives of immigrants. The black and white short pictured a black dancer who moved within the boundaries of lines, outlined by white dust. This contrast in colour was incredibly powerful, particularly when the dancer proceeded to lash out and smear white borders, harking back to ideas of white colonialism. The stories were seemingly poignant, however, very difficult to listen to as they were unfortunately drowned out by ill-fitting pumping house music, baring no significance to the topic of immigration. 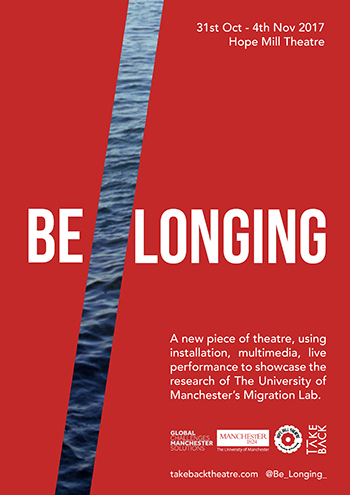 The play commenced with various stories that told the lives of immigrants attempting to cross borders, and the actors did well to tell these vividly using minimal set. The performance was strongest at juxtaposing journeys, some where people had cut holes in car roofs to access transport over borders, comparing those to daily commuters in Manchester. By contrasting the idea of travelling over immigration control with local trips to “Piccadilly Gardens”, the performance highlighted the freedom that many, including the audience hold. However, this comparison did not develop further into a conversation about the privileges that the western community attain, the piece simply moved on to a different topic. There were issues that had potential, such as the idea of “your brain being half asleep when sleeping in an unknown location” and the play would have done well to hone in on these ideas, referencing a few well researched stories. Instead, the piece was overwhelmed by fragments of accounts that seemed to reach no climax. What seemed a pivotal point in the play, was an an analogy of a place that bordered its country with walls. When the story teller was asked, “then what happened?”, the response was a shrug of their shoulders. For me this confirmed that the play had little to suggest about how society can progress in its understanding of borders and therefore immigrants. The play had an optimistic ending, displaying a video of a charity that helps refugees and while this was comforting, I would have liked to have come away feeling provoked as to why society creates distinctions, rooted in imaginary margins.